Located in the historic O’Kane Building in downtown Bend, Red Chair Gallery celebrates the collective spirit of creativity through art. 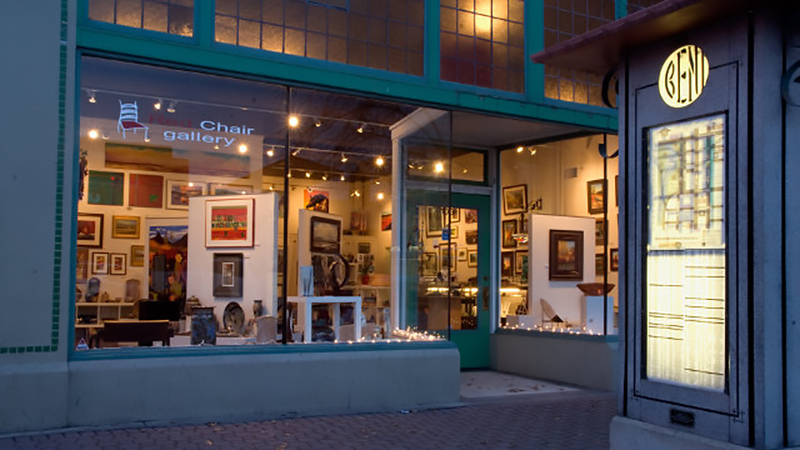 The gallery opened its doors in 2010 when a group of artists in the Bend area saw an opportunity for local artists to exhibit and sell their wares. This group consisted of potters, painters, jewelers, fiber artists, mosaic and glass artists. Once the concept was formalized, 30 artists stepped up and became members. Today, Red Chair Gallery consists of consisting of four partners, each of whom is an artist, thereby creating a core group with the experience and hands on approach the gallery deserves. Red Chair Gallery has blossomed into a venue for Oregon artists, providing an opportunity for the exchange of ideas and the promotion of fine art and contemporary craft to casual observers and serious collectors alike. Red Chair Gallery is open from 10:00 a.m. – 6:00 p.m. Monday – Saturday and from 12:00 p.m. – 4:00 p.m. on Sunday. Be sure to stop by on the first Friday of every month to celebrate Bend’s Art Walk in the gallery.